Sometimes this is too easy. Running for 30 years, Grange Hill was one of the world’s longest-running kid’s TV shows as well as one of the longest-running dramas on British television. Set in the (fictional) eponymous school, Grange Hill was conceived by writer Phil “Brookside” Redmond in 1975, although the first episode did not air until 1978. From the start the series caused controversy for its gritty portrayal of school life, a million miles away from the more idealistic and anodyne school dramas that preceded it. This reached its zenith in the mid-1980s with the show’s infamous storyline about the character Zammo McGuire and his addiction to heroin. The story led to the cast recording an anti-drug single, Just Say No (and an accompanying, hysterically awful video) – a cover of a LaToya Jackson’s US single released to promote then-First Lady Nancy Reagan’s own anti-drug programme – and an album. 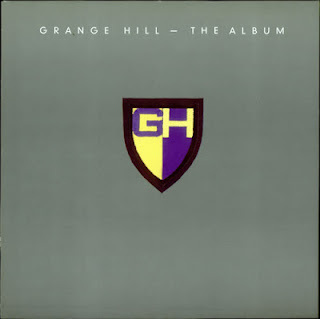 The originally-titled Grange Hill – The Album was released to celebrate the show’s 10th anniversary and to capitalise on the success of the single, which sold over 250,000 copies, reached the top five and raised £150,000 for anti-drug charities. The cast were whisked off to the White House to meet Mrs Reagan and to promote the anti-drugs message, however the credibility of the campaign was somewhat tarnished when several years later Erkan Mustafa, who played Roland Browning, claimed that many in the cast were on drugs themselves. But back to the album: and what a corker of an album it is. As well as containing the obligatory hit single it also includes its follow-up, the dire You Know The Teacher (Smash Head) with its sub-John Barnes rap, a handful of newly-written but soppy and badly sung songs about teenage angst and a whole side of terrible cover versions of singalong favourites including Fleetwood Mac’s Don’t Stop (sung by Zammo, Roland and various other cast members), the Who’s My Generation and, naturally, the Boomtown Rats’ ode to angry school children I Don’t Like Mondays. It’s horrific and, to prove the point, here for your enjoyment are what are undoubtedly the two worst tracks on this hideous release – the second single You Know The Teacher (Smash Head) which, unlike its predecessor failed to chart and the album’s closing track, an out-of-tune medley of The Greatest Love of All and That’s What Friends Are For. British actor Johnny Briggs has had a long, distinguished career in the business of show. Born in 1935 he graduated from the Italia Conti Stage School and was immediately thrust into movies, appearing in dozens of gritty dramas (Cosh Boy, the Leather Boys), war epics (633 Squadron, Sink the Bismarck!) and comedies (Carry On Up the Khyber, Bless This House) before landing the role that would make him famous: for 30 years he starred in Coronation Street (world's longest-running TV soap opera) as factory owner and Deidre Barlow-shagger Mike Baldwin. But we’re not interested in his film and TV work, are we? No. What we’re celebrating today is his one attempt at vinyl immortality. 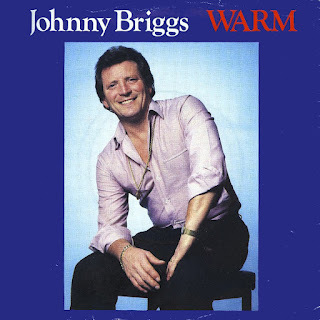 For in 1983 Johnny released a single on the tiny (and short-lived) MVM record label: Warm backed with Livin’ on the Road. This dismal offering sold about three copies: Corrie fans must have been bewildered by the fact that the bluff, gruff Mike Baldwin emitted such a thin, reedy vocal when he tried to sing. Warm? Barely tepid at best; lukewarm more like. Although the writing credits on both sides of this dull slice of eighties pap went to Cass and Casstree, the sleeve rightly credits one Cass Casstree (as opposed to a brace of him/them) with having written the words and music and played keyboards on this insipid ballad. Bury-based Casstree has spent decades trying to have a hit: he wrote Sharon Benson’s 1988 flop Our Love’s Alive (she would later record a ‘hip’ version of the EastEnders theme, retitled I'll Always Believe In You), and still works as a professional musician, appearing at the Edinburgh Fringe in 2005 and gigging regularly in his home town. But back to Johnny; look at him on the cover, with his flicked back hair and gold medallion hanging over his tight, open shirt. Doesn’t he make you Warm? You’d think he would learn from this appalling crime, but in 1995 he would team up with co-star Amanda Barrie to record a simply dreadful version of the Frank and Nancy Sinatra classic Something Stupid which, when released as the B-side to the Corrie cast singing Always Look On the Bright Side of Life, reached number 35 in the UK singles charts. There’s just no accounting for taste. Enjoy..and big thanks to Mick Dillingham for reminding me of this monstrosity. Written by Victor Young, Ray Evans and Jay Livingston for the eponymous 1947 Marlene Dietrich movie, Golden Earrings is a classic which has been covered by everyone from Keith Jarrett, Dinah Shore and Peggy Lee (who had a number two hit in the US charts with the song in the same year as the film) to the Del Rubio Triplets. Perhaps unsurprisingly another cover version made some 30 years after the original recording, failed to set the British charts alight. Listen to this and I’m sure you’ll understand why: who in their right mind thought this absurd recording would ever be a hit? It's throroughly insane - but I have to admit I absolutely love it. You might have never heard of The Enid, the British rock band who are about to enter their 40th year of existence, but I’ll bet you at some point or another you’ve hummed, whistled or sang along to one of their performances: they may have a reputation for ridiculous, overblown prog-rock nonsense but they were also the backing band for Kim Wilde, playing the vast majority of the music on her debut album (Water on Glass, Kids in America). Formed in 1974 by Robert John Godfrey, who had been the musical director for prog-rockers Barclay James Harvest, and John Francis Lickerish, the band released their first album, In the Region of the Summer Stars, in 1976, just as punk was tearing up the rule book. 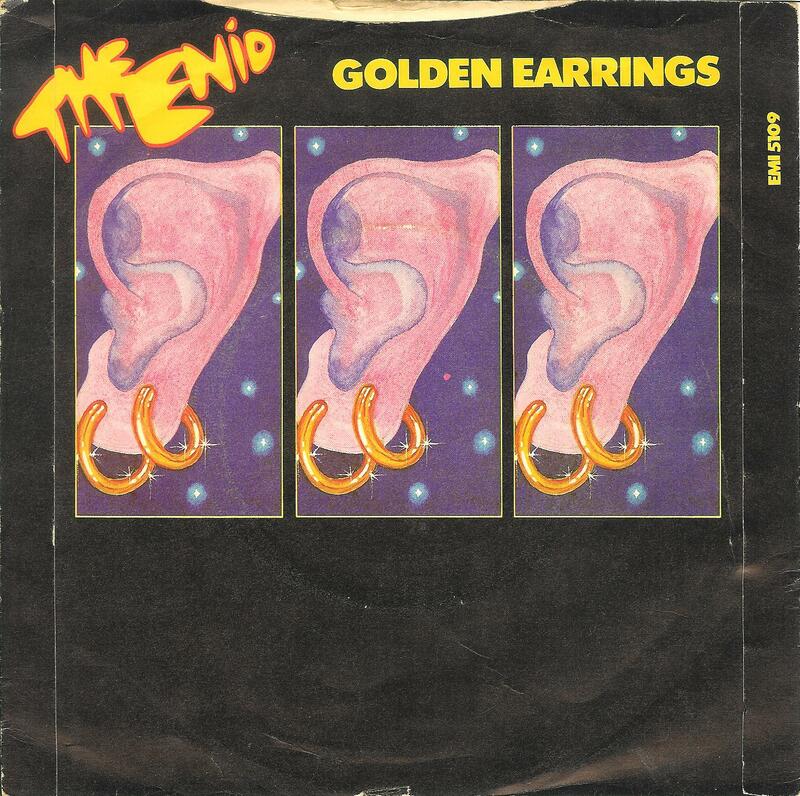 Their recording of Golden Earrings first appeared as an A-side the following year, around the time of their second album Aerie Faerie Nonsense, although the track did not appear on either album. The single bombed…yet for some warped reason EMI decided to re-issue it three years later as the B-side to another non-album single 665 The Great Bean (a re-recording of their earlier album track the Devil). It too sank without a trace. The band, in various guises but always fronted by Robert John Godfrey, has continued to record (and perform) sporadically ever since: a farewell gig in 1988 proved to be a pause to their career rather than an end to it as the band reformed in 1995 and since then they have released several new albums. As far as I know none of them has included a re-recording of this piece of bombastic drivel. Here’s a disc that’s been gathering dust in my collection for almost 30 years – time methinks to inflict it on you. What do you get when you lump together a precocious, screeching brat on vocals, a nasty kiddie-choir to back her up, a terrible cutesy synth and a ridiculous chicken impersonator? No? 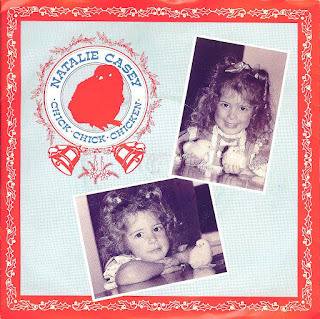 It’s Chick Chick Chicken by Natalie Casey. Released in in the hope of grabbing a hit at Christmas 1983, this is just about as horrible a slice of kiddie pop as you can imagine. Although Natalie later went on to fame in TV soap Hollyoaks and dire ‘comedy’ series Two Pints of Lager, she was just three years old when she recorded her single, which reached the dizzying heights of number 72 in the UK Singles Chart in early 1984 and made her the youngest person ever to have a recording in the UK chart. Now a respected star of stage musicals (she’s recently been in Legally Blonde and is about to star in the musical version of 9 to 5), some of you with memories long enough may recall her appearance on the BBC’s kids show Saturday Superstore when she had to ask Boy George to take her to the toilet (he didn’t, Culture Club member Roy Hay took her instead), but the assumption is that the poor deluded moppet thought that George was a woman. Having made tinkle Natalie then returned to whisper into George’s ear: “what’s for dinner?”- apparently no longer mistaking him for a toilet attendant but for a dinner lady instead. Natalie later resurrected her one stab at chart stardom, performing the song in 2008 during a live Two Pints of Lager special. She would have been around 28 at the time; has she no shame? Produced by Peter Gosling (chickens, geese…what’s next) who during a long career in music for children was involved in Bodger and Badger, Play School, Chockablock, Number 73, Noah and Nellie in the Skylark and many, many more, as an extra I’ve include the even more awful B-side (‘written’ by Peter Gosling), which is confusingly listed on the cover as Natalie’s Disco Party but, correctly judging by the lyrics, on the label as Natalie’s Disco Nursery. The Janet Greene story is a fascinating footnote in the history of American folk-rock. Called the Anti-Baez by contemporary commentators, she was the right wing’s answer to all of those liberal longhairs filling up America’s airwaves with their anti-war rhetoric, touted by the Christian Anti-Communism Crusade (CACC) as an antidote to the growing number of commie sympathisers clogging up the charts. Already a TV star in her hometown of Columbus, Ohio, Greene (real name Greenroos) and her husband David discovered the message of the CACC when their propaganda started to infiltrate the Ohio school system. Ohio had become heavily anti-Communist during the Cold War: in 1950 Time Magazine reported that police officers in Columbus were warning youth clubs to be suspicious of communist agitators. Dave, who quickly became a fan of Australian anti-communist (and founder of the CACC) Fred Schwarz, heard that Schwarz was setting up a musical programme and – quicker than you could say ‘reds under the bed’ - he and the wife were off to California. At a press conference Schwarz, who gained fame as the author of the international bestseller You Can Trust The Communists (to be Communists), introduced his ‘discovery’ with the following words: "Every great movement throughout history has expressed its inspiration in music. The Anti-Communist movement is young and music has not played a large part in its development to date…the Christian Anti-Communism Crusade is adding a new dimension to its activity, the dimension of music. We are satisfied with nothing less than the best and we have followed this policy in securing the services of Janet Greene as music director. Janet is a vivacious and beautiful young lady of remarkable musical talent. For the past several years, she had been the leading TV star of Columbus, Ohio where her early morning program, Cinderella, has delighted the hearts of the children. 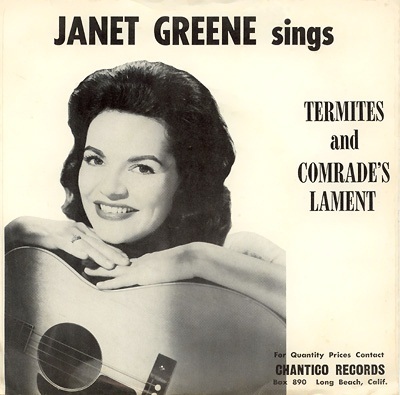 Conscious of the magnitude of the Communist danger, at considerable personal financial sacrifice, she had surrendered her TV program to become music director of the Christian Anti-Communism Crusade." A cute girl with a decent voice and an established following seemed perfect for Fred’s scheme to infiltrate the pop scene; add in to the mix songs with titles such as Commie Lies, Poor Left Winger and today’s offering - Comrade's Lament – and they couldn’t go wrong, surely? Ah, if only it was that easy to beat the red menace. According to the book Mothers of Conservatism: Women and the Post-war Right (By Michelle M Nickerson), Janet spent her time listening ‘to recordings of Schwarz’ speeches and transformed them into lyrics’ whilst hubby Dave acted as her PR agent. Billed as a ‘new and effective anti-Communist weapon’, Janet was even known to drag her two daughters on stage with her and perform the dreadful Ballad of the Green Berets. Luckily her four 45s failed to trouble the charts or unseat Joan Baez (who, apparently, Janet quietly admired) from the top of her red pedestal. By 1967 Janet had grown disenchanted with the whole CACC set up and quit.